Click on the Start Menu button and type the word autoplay in the search box. Click on the first result and the AutoPlay window will open. Here, you can change the AutoPlay settings according to your needs and preferences. If AutoPlay is enabled and, for some reason, you find it annoying and you want to disable it, uncheck the small box right next to Use AutoPlay for all media and devices. Now click on the Save button from the bottom of the window and you won't be bothered by it again. If AutoPlay is disabled and you want to enable it again, just check the same option and click on Save. If you want to have Autoplay enabled and change its behavior please continue reading these instructions carefully. Each category (audio, movies, pictures, software) has a drop-down list with specific actions. Some of these actions are common for all categories while some are different. For example, Open folder to view files using Windows Explorer, Take no action and Ask me every time are standard actions available to all categories. Now let's go through some of the main categories and see what other options you have. 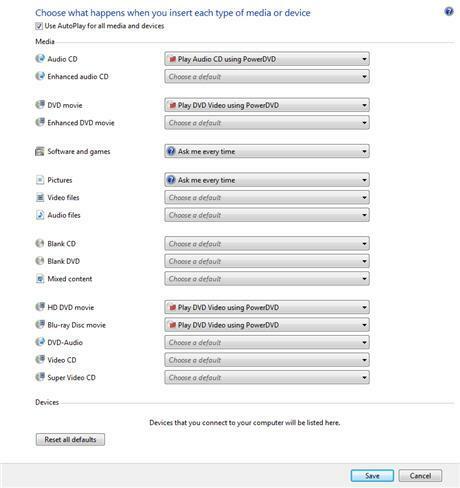 As an example, for Audio CD you can also set one of these actions: Play audio CD using Windows Media Player, Rip music from CD using Windows Media Player and Play audio CD using Windows Media Center. If you want the audio CD to be played automatically once you insert it, choose the first or the third option. If you don't know what to choose, select Ask me every time and you will have the possibility to choose between all options when an audio CD is inserted. When you insert a DVD or CD that contains pictures, you can choose to Import the pictures using Windows or to View pictures using Windows. In the Software and games category, you have the option to Install or run program which is very useful if you have lots of CDs or DVDs with different programs that you want to try. One of the most useful options of AutoPlay is the possibility to choose what player will open your movies stored on DVD or CD. As you can see in the screenshot, besides Windows Media Player, I have installed other two players:GOM Player and PowerDVD. I like to use PowerDVD to open DVD movies and GOM Player for any other CD movies. Unfortunately, Windows Vista doesn't provide a tool to add items to the AutoPlay menu. However, some programs will ask if you would like to add them to the AutoPlay menu during the installation process. If you are not satisfied with your current configuration of AutoPlay and you want to revert to the initial settings, click on the Reset all defaults button and then on Save. Is there no way to set it to use a custom app that isn't listed for the autoplay option? I created a file named XnView_Autoplay.reg with the following contents. Now when I insert media with pictures (say an SD card from my camera), I have an option to view them in XnView. Modify and use according to your need. How do you create a new file in the registry? I have version 6.0. The options I get are to create a new "Key, String Value, Binary Value, DWORD, QWORD, Multi-string value or Expandable String Value". Can anyone provide more detail on how to create the file since I have never done it before? i have tried in control panel by changing the settings, it didnt worked..is there any way to enable the auto play option? Hi there everytime i put a cd or dvd or even a flash drive my autplay pop up is not showing i have not made any changes to my autoplay and yet i am not get my autoplay pop options can tell what i can do to fix this problem.